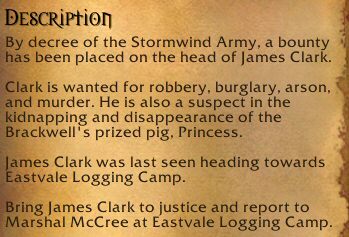 He is also a suspect in the kidnapping and disappearance of the Brackwell's prized pig, Princess. "Word travels fast!" I observe. "This makes no sense!" Norman protests. "We just did that!" No, really. 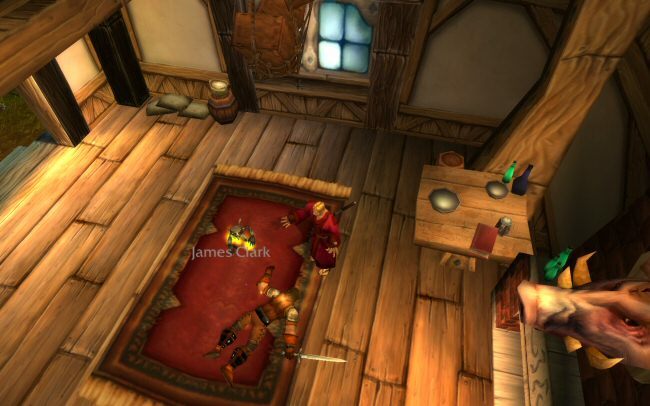 The game sends you to kill an NPC who is (wrongfully) accused of doing something you did in an earlier quest. How many people even realized they were murdering someone to cover up their own crime? I'll bet most players have no idea. 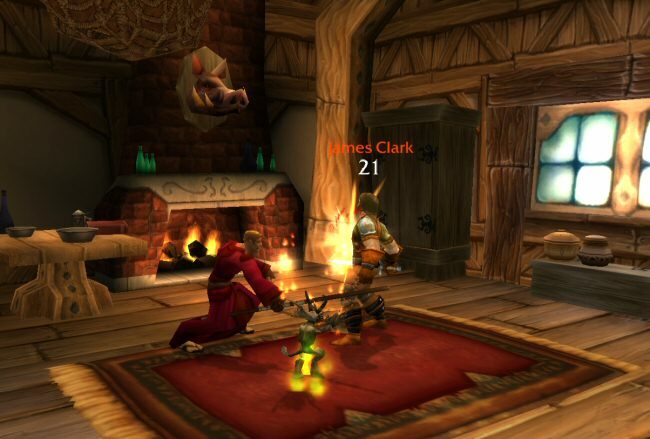 It turns out James Clark is living right inside the logging camp. He has his own house and everything. Well, door-less shack, but that's the only kind of house anyone has around here. The point is, he's not hurting anyone. He's just standing around. "Why would they put this man on a wanted poster?" Norman asks. "I expected they wanted us to hunt him down, or fight through his gang. But he's right here in town and everyone knows it. The guards could deal with him anytime they wanted!" "You do not want that. This is a stroke of luck for you. Now get in there and give him the business." "What? Why? Why is this good luck?" "Imagine if the guards came and tried to arrest him. They would read him his list of charges, and he might provide some alibi that proves he wasn't the one that killed the famous, expensive, beloved family pig. Then they might go looking to see who else might have done it. As strange as it may sound, they might even get it right." "But ... I can't just walk into a man's house and kill him." "Why not?" I shrug, "You've killed other people. They say he's guilty of murder." "They also say he's guilty of killing a pig when he isn't." "True. But you might end up on the wanted poster yourself if you don't get rid of him." "Sorry boss. You gotta kill this guy. It's basic self-defense." 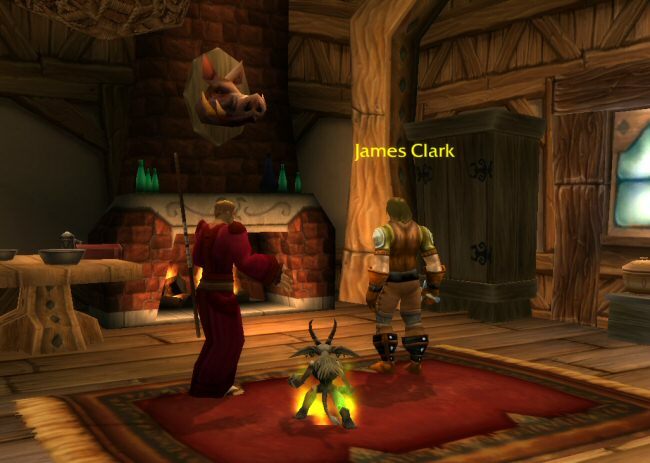 So we go inside James Clark's house. He doesn't seem to mind. All three of us are gathered in the middle of his single unfurnished room. "So ... hi there," Norman says nervously. "I hope you don't mind us coming in like this, but ... er. Anyway. I'm really sorry about this." There is a minute or so of screaming and stabbing and James being hit on the head with Noman's staff. After that he goes down. "Sorry Jimmy," I say. "But thanks for being such a good sport." "I feel queasy," Norman says. "Look boss. Don't sweat this. You're in the clear now and he might have been guilty of something anyway. And besides, now you get to report back to the guards and get paid for this." Norman stares at the floor for a while. 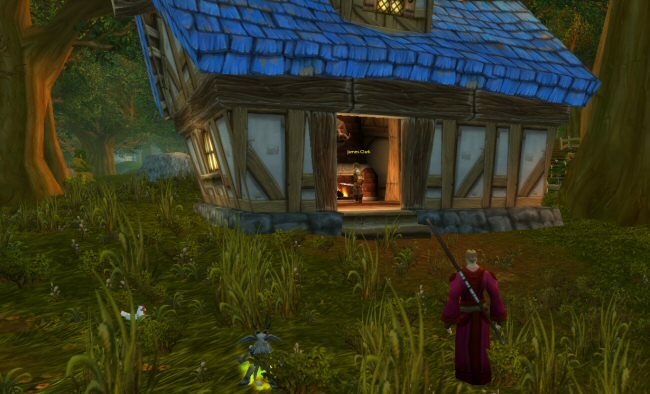 Finally he says, "I think we should leave Elwynn Forest. For good. Maybe try to help people someplace else." Next Week: Let's get out of town for a few days.